Nikki Dee's first semi-cognizant (meaning that she did experience it less consciously last year and will experience it more consciously in years to come) encounter with the snow did not go over all that well. Perhaps you can tell by the look on her face. It probably wasn't so much the snow itself but just one of dem dere days. Changing the topic a little, the kid has surprised me twice lately. Last week, we were playing one of her songs, and Cuppa did what we often do at the end of a song; she clapped. Well, didn't the kid give her a weird look as if to say, "What the heck are you doing grandma?" And she was right, for the song picked up again for another line or two before the real ending, and then she clapped. It was a titch humbling doncha know? And just yesterday, I was sitting with her on the couch watching Elmo with her when she began to giggle. She jumped onto the floor with a big smile on her face. Lo and behold, one of her favourite segments came on next, and she was all primed for it. We have quite a few Elmos taped, and from the spot that I had just seen, I couldn't guess what was coming next, but she knew. I was shocked. These kids are smart let me tell ya. A lot smarter than we usually give them credit for. That's why we adults need to exercise some care in our words and actions. 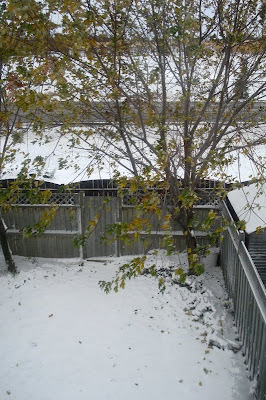 As far as winter storms go, it didn't amount to much, but for October it was enough to give us pause. It was also a little worse than it looks because the driveways and roads got pretty icy. SIL is anxious about getting his winter tires on because he does a lot of driving, but, naturally, everyone is thinking the same thing, and tire places are booked. 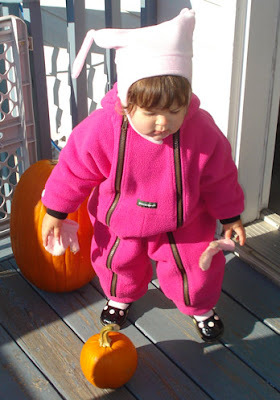 But the snow will soon be gone because temperatures will go up to 11°C (52°F) on Friday, which should result in a decent Halloween for the kiddies. We don't usually bother with winter tires until mid to late November; hopefully, this storm was a one-off, and that schedule will still be viable this year. What a miserable day: windy, rainy and S N O W Y ! ! ! Yes, you read correctly — snowing on October 28! How dare The Weather Network Network?! They should know better, should know that it shouldn't snow for almost another month. Nevertheless, it has predicted that we can expect 10cm (4in) or more of the white stuff overnight — and it's highly doubtful that it will still be mixed with rain as the temperature drops this evening. Sigh. To make matters worse, on this contemptible day, I managed to rouse my body enough to brave the elements and take a miserable walk through a parking lot for the purpose of stocking up on provender. And I did what I almost invariably do: played the part of the absentminded professor and overlooked something on my list. This time it was the potatoes. It's hard being me, and I suppose living with me ... and perhaps in reading this blog. Fortunately, I don't need the potatoes for tonight as we're having linguine, but it will mean another trip to the store before I am darned good and ready. Grrrr. Apart from mealtimes, however, she does hum on occasion. Quite some time ago, she attempted to hum along with me as we danced while I also hummed the tune. 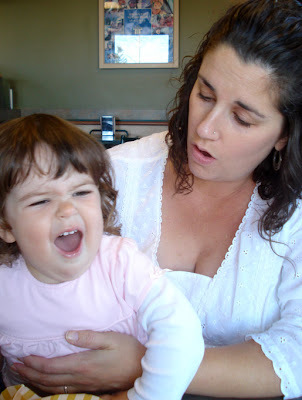 She has continued to hum along every now and then although not frequently enough that we expect it. 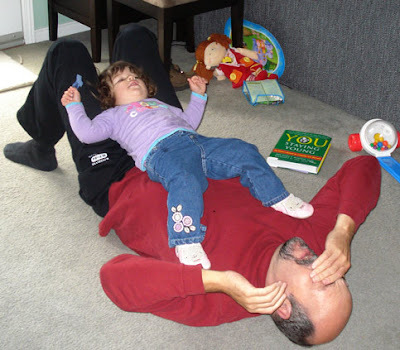 Therefore, we were delighted when Daddy started to sing the Elmo song to her, and she made the attempt to join in. I think she did a pretty good job. And we were there with the camera. 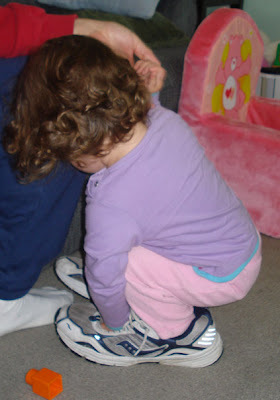 There was a time, however, when we were sure to keep replacement laces on hand because the unceremonious breaking-of-the-lace was not an uncommon event. Frequently, I'd be lacing up my shoes when a lace would simply snap in two, and I don't think my Samson-like strength was the cause of the mishap — it was all down to the material. Somewhere along the line, however, that changed. Now, we can own shoes for years, use them regularly, and the laces will most likely remain intact and reliable for the duration. Even in the case of the recent changing, the shoelace in question didn't snap; it simply frayed and weakened but held on, and I left it in that condition for quite a while before I got around to dealing with it. 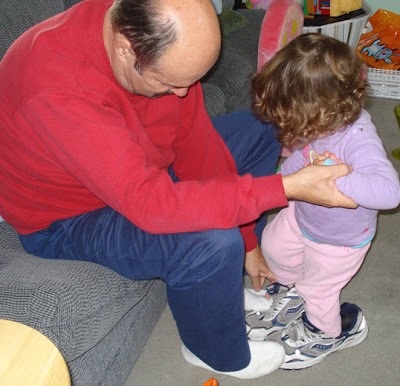 I'm not sure when it all changed — when the miracle of the shoelace occurred. It seems to me that it might have been the late seventies or early to mid eighties, but I can't be sure. Maybe it wasn't even an overnight shift; maybe they improved gradually to the point where they seldom seem to fail; but, improve they did. So, I wonder why, we still have to buy them in pairs. 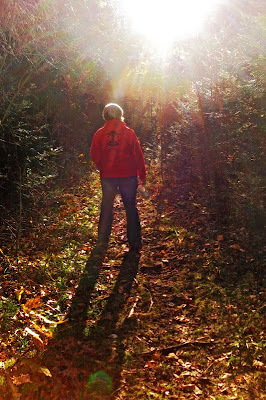 Let's begin Foto Friday with a somewhat unique photo of Cuppa that I took last weekend as she walked into a patch the sunlight in the woods on a colourful autumn afternoon. As good Canadians we all endeavour to raise a proper Canadian girl who is devoted to Tim Hortons. Here she is with Mom at Tims and seems to be loving it. Scenes from around the house this week. 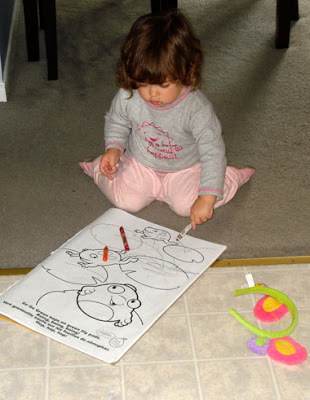 Below, I was working in the kitchen and turned to find that she had pulled down her colouring and was going to it. 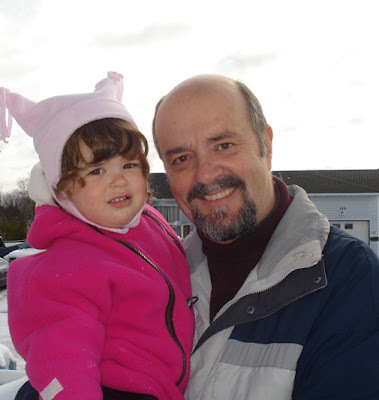 She was quiet and absorbed, which I was grateful for, and I continued to cook. She only coloured the floor a little bit, and it was with washable crayons, so it was all good. 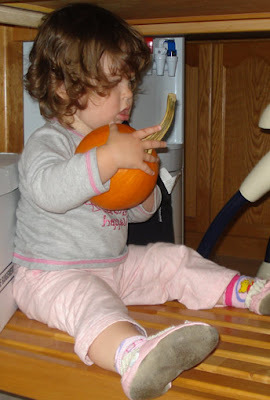 The pint-sized pumpkin that we/she brought home from the outing to the store last week. Finally, here she is doing outside work with the same pumpkin (with a normal-sized one in the background). I guess I can proclaim that pre-winter hath arrived, for we turned the furnace on last night. The house was down to 16.5°C (62°F) when we got home late afternoon, and with the forecast taking us down to nearly freezing, we threw in the metaphorical towel. One hates to give in too soon because winter, which in essence I actually don't mind, hangs around so long. Soon though, I'll start looking forward to Christmas and family reunions, and that's good. 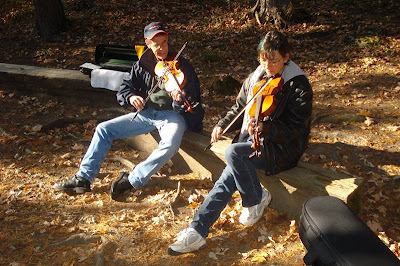 Last night, I went to bed humming The Stone Frigate, which is one of the hundreds of tunes in the [fiddling] jam book that we use. Except that at the time, I couldn't remember the name: just the tune. This morning I awoke with the name in my head, but the tune totally escapes me. I think it would be easier if we had the memory hook of words to go with the tunes, but alas, we don't, and I suffer from all kinds of blocks because of that. More often that not, either the tune or the title eludes me. As I've mentioned previously, names and I don't get along very well. Anyway, tonight is jam night, and I'll go again ... and do more sitting than playing again. The great majority of tunes are played too fast for me to sight read, so I note them, and try them later at home where I can proceed more methodically. It would still be nice to have lyrics to associate tunes with, however. It would make it easier on my poor old brain. Although some days go slowly, life goes quickly. Since Nikki Dee begins her nineteenth month of existence (in present form) today, I thought a few recent poses were in order. I know two days ago (Foto Friday) is pretty recent, but bear with Grampa anyway, will ya? 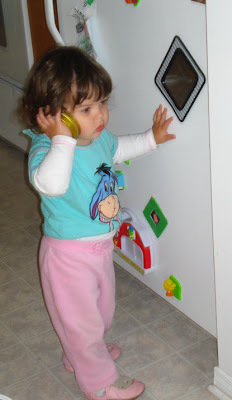 The phone rang the other day, and shortly thereafter, she picked up whatever was handy, placed it by her ear and commenced to jabber. 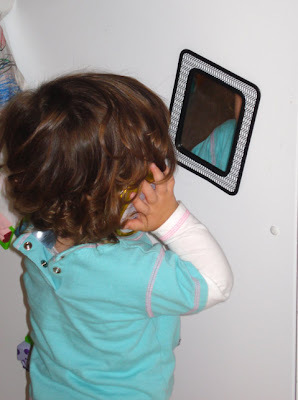 In addition to jabbering into pretend phones, a favourite pastime in to look at herself in the mirror. In these two pics she does both. She quite enjoys going to the store — any store will do — where she can enjoy all of the sights and sounds and jabber some more. 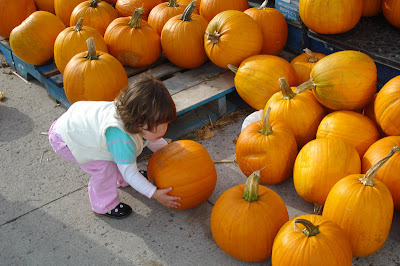 At the door the other day, she became quite interested in the pumpkins and tried to lift several. Soon, she found a little one that she could manage, and for some reason, it ended up going home with her. She gets lots of walkies, especially to the park. It's almost at the end of the street (or several streets) , and this is the view as we approach. 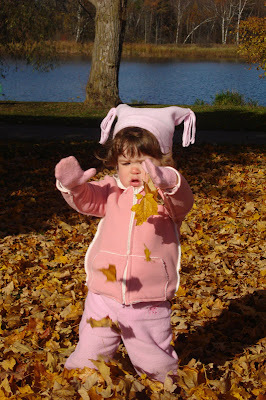 And then she got to play in the leaves. 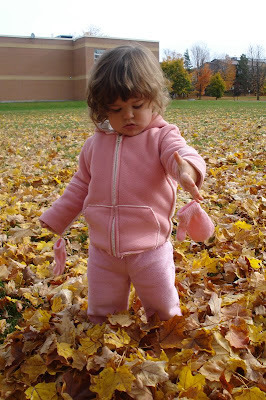 Following is an absolutely stunning video of her (just kidding) walking through the leaves. In the clip, I mention that she veers to the water on occasion but was being pretty good about accepting my redirection. Well, that stopped shortly after this clip when her desire to get to the water became quite strong indeed. She became quite vocal and unhappy with my insistence that we go the other, and I became a grouchy old man for a few minutes. That does happen periodically, you know? But we're both over it now, so Happy Birthday little Nikki Dee. 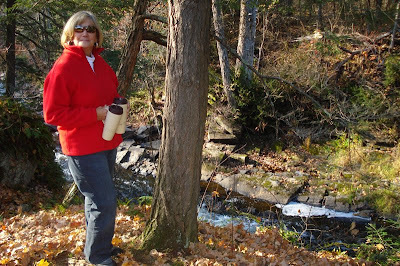 On yet another gorgeous autumn day, Cuppa and I headed to the Mill yesterday for a walk in the woods. Of course, first we had to stop at Tims for cuppas of coffee — extra large mugs, naturally, and here Cuppa holds both as I take this picture. Down below yo can glimpse a wee bit of the Indian River (sorry, but that's what it's called). My focal point in the next photo was supposed to be the lighted clearing on the rise in the background, but whether that worked or not, it may give you an idea of just how pleasant the day and our walk were. I hope your day was at least half as delightful as ours, and that you were also in fine fettle even if not in a fine fiddle. No, we don't dance salsa or anything else on Friday night; we're too doggone tired. Yes, these old foggies come home pretty weary on Friday night after tending to the needs of Nikki Dee all week. While she is a dear treasure, she can wear a body out. In point of fact, Cuppa and I have discovered that she can wear two bodies out. She doesn't give us a lot of space to withdraw for a spell and/or turn our minds to items of adult interest and stimulation. While it's true that we take turns coming home and tending to our chores and interests here while the other mans (or womans) the fort, we still wear down significantly by week's end because we're both still supervising her a lot, and it's both tedious and demanding. So, we drag our weary bods home on Friday and, more often than not, do our salsa thing. No again ... still not the dance. We grab a glass of wine, white for her and red for me, and plunk ourselves in front of the tv. Then we decide to have snack whilst we marshal our reserves, and it has come to be that the snack usually turns out to be pretty healthy: Tostitos multigrain chips that we dip in sour cream and salsa (we keep both options available). Phew! I finally explained the salsa ... thought I would never get back there. While we tell ourselves that it's a snack, by the time we polish off the chips, not to mention the wine (except that I just mentioned it), we're full and don't usually bother to eat anything else before tumbling into bed ... to sleep ... dammit. Cuppa took these first two pictures when she walked Nikki Dee to the park the other day, and she has graciously saved some for me to post. 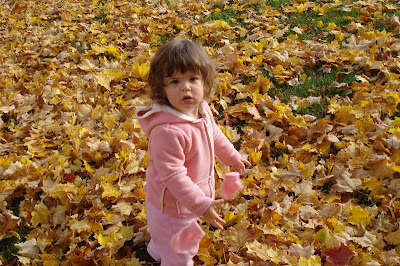 Nikki Dee is having a great time playing in the leaves. The next picture is all about getting ready for winter. 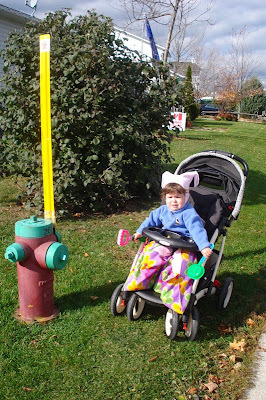 They've put markers like this on all the fire hydrants in town this week, so they can still be found when they get buried in snow in afew months. Nikki Dee was having a meltdown at the time; fortunately, she doesn't do that very often at all. 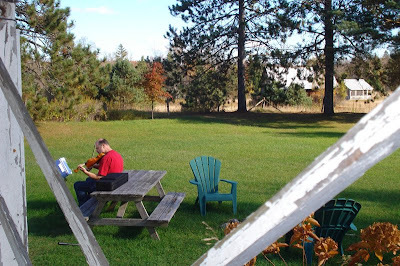 I took my fiddle to the cottage last weekend and played it in the great outdoors. On two other days, I took it to the planer mill (that's what it used to be) that you see in the background on the extreme right. It's roofed but all screened in: the best of both indoors and outdoors wrapped up in one wonderful structure. 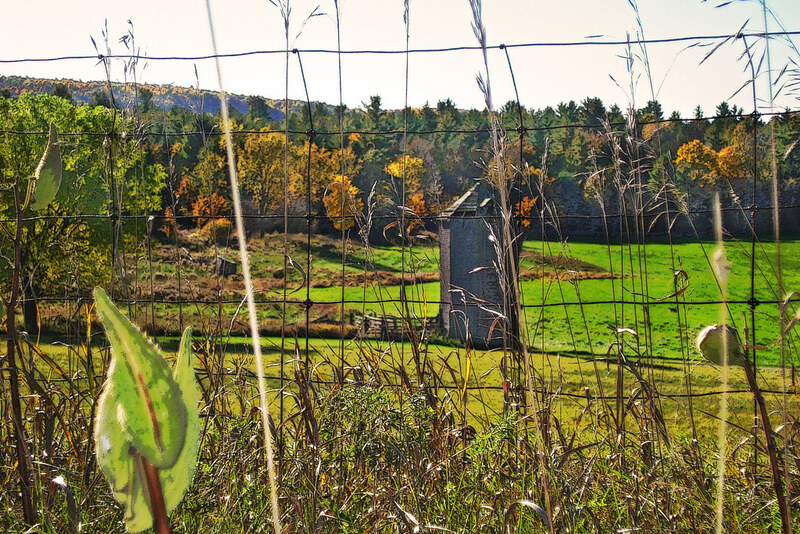 Finally, here are two more photos taken on our journey to the cottage last weekend. For these, I humbly suggest that you click on them to view them large. They will open in a new window, so you don't lose your place if that's a concern. They were taken from approximately the same spot, the first looking left and the second looking right. That's an old wood silo in the first picture. I don't recall ever seeing another one like it. I suppose most are made of wood, but this one seems to be older somehow. Is it just my own misperception (which spellchecker doesn't like but dictionary.com says is okay), or did clapping become reinvented or redefined sometime within the last few decades. I noticed it again a short while ago watching So You Think you Can Dance Canada. When they acknowledged the choreographers, and the audience clapped for them, but the choreographers clapped too. I wonder when the fashion changed, or maybe it didn't where you're from? Maybe it was always that way in some circles? But in my memory, when people clapped for you, you accepted it quietly and humbly. You didn't start clapping too. Now, you do! My first recollection of such a thing was at a PD Day, probably around the mid-eighties, where we assembled to hear an American speaker. He was very good, lively, funny, and well-rehearsed. At the end, when we clapped our appreciation, he clapped too. I took it to mean that he was applauding us for being a good, attentive audience. It worked then, but I don't always know what it means. In the case of Dance, were the choreographers clapping for themselves, the audience, the program in general, or were they simply going along with the celebratory spirit of the occasion? While I don't mind the new fashion at all, I wonder when, where and why it changed. And in some cases, what it means. Or are my memories faulty? What a fabulous Thanksgiving weekend! Whoever decided that it would be this weekend in October certainly hit the mark here in Southern Ontario. It was sunny and warm (for here at this time of year). 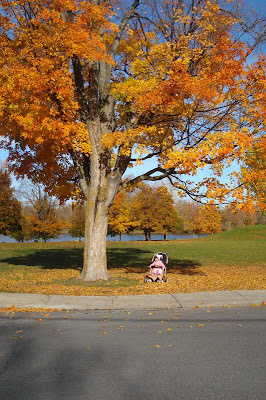 The changing leaves seemed to be at their peak or so close to it that we won't quibble. Yes, the colour was splendiferous! Although the main roads from here to Riverwood would certainly be considered relatively rural and relatively lightly trafficked, we still opted to take the even more rural back route. It's slower with more twists and turns, but it's pretty relaxing and very scenic in places. The tress are usually close to the road, but we also pass a number of lakes and obtain a number of views from the higher spots in the uplands through which we travel. One misses so many photo-ops while on the road. Even though we could have stopped a lot and did stop some, one simply can't keep doing that if one is ever going to reach his destination. Some spots aren't conducive, and one doesn't always have all of the time in the world at one's disposal. (We need a pronoun other than "one." I feel so darned formal when I use it.) Here is one stop that I made on the half of the journey closer to here than there: seemingly of a former church now become a community hall, the John Thomson Hall on Snow Station Road to be exact. We had stopped here, just outside of Digby, I think, to take a picture of a lake. I took this shot as well to represent a typical view of the road on that day. We are on the rocky and forested Canadian Shield here (as we were for most of the trip). 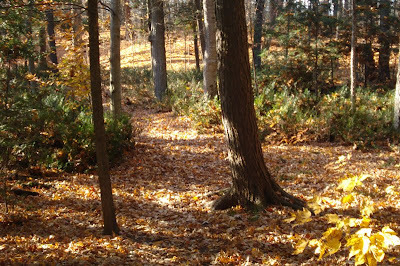 We took yet another detour from Bancroft to Riverwood along Lower Faraday Road. I had to stop one more time to snap this shot. Because there is a sharp turn in the road ahead, we appear to be hemmed in by a wall of trees, and the cottage and shed add to the rusticity of the scene. Those are three pics of our journey. Cuppa has posted others, and both of us may post additional photos in the course of the next few days. Was that what it was called, milk monitor? I think so, and that's the title in my mind. Once upon a time, when young AC was in elementary school, a family could opt to have their children be supplied with a pint of milk per day, about halfway through the morning. It was delivered to the school [fittingly] in pint-sized, glass bottles and then put into portable wooden crate: one per class. Each week it would be some lucky student's turn to collect the milk box and transport it back to the classroom. I seem to remember getting my fair share of such opportunities. While I can't recall for absolute certain if I carried the box differently at first, I do remember feeling quite the adept young fellow by carrying it slung against my hip with only one hand on the box. Yes, I was quite proud of myself, and, fortunately, pride did not go before a fall. I'm not sure in what year I began to perform this chore or when it stopped. May it possibly have continued from about grade three to seven (which was when elementary school finished in Montreal in those days)? In my mind, however, I am in grade five and in Miss McDonald's class, the lovable Miss McDonald. Yes, I'm in the country but pre-published this for Sunday (gotta love that relatively recent feature). I've recently gotten back to processing some wedding photos. These are pre-wedding shots of our side of the family. Actually, once she got used to me playing grinding and screeching on it a bit, and once she discovered that she wasn't going to get her turn, she pretty well let me be. In my books, that constitutes an minor miracle. We're off to the cottage/camp/cabin (take your pick depending on where you're from, but it's cottage to us) this weekend to celebrate Thanksgiving with the inlaws. The weather forecast is good, and the colour should still be pretty wonderful too. That's four whole days off the Nikki Dee detail; as much as I adore her, I greatly anticipate to the respite. I don't think it's a holiday in the USA or other parts, but being in a more northerly clime, we have our TG much earlier here than down there in the tropical USA. 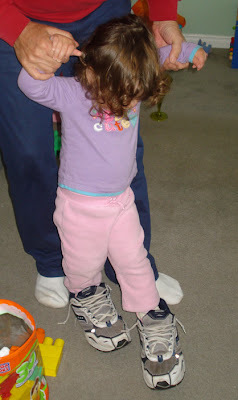 I don't mind helping the kid try my shoes on for size. But I'm not up to helping her walk a mile in them. A step or two was quite enough. See that You Staying Young book on the floor beside me? I was trying to do some exercises from it: exercises that are supposed to take about ten minutes to do. I think it took me 45 minutes. I don't think I finished. I had an Aw Shucks! moment yesterday in the midst of opening up various bills. There was an envelope from Plan Canada. 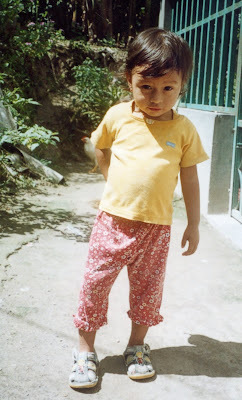 We sponsor a child in Guatemala through this organization, formerly known as Foster Parents Plan. So I expected it to be from the organization itself, but instead it was a colouring done by our little sponsored daughter, Nathaly Rosmeri. This is the second message we've received in the year or so since we decided to sponsor Nathaly. The first was a note from her mother, but this was done by the child herself, and is certainly an Aw Shucks! kind of thing to stick on our fridge. Nathaly Rosmeri just turned four and lives with her mother and two brothers and no father, apparently. We've sponsored her for over a year now, but for a long time I had felt guilty for not adopting a child. I think it started when I heard an African orphan choir when our own daughter was little. I was moved, but there wasn't much extra cash lying around, so I resisted. Nevertheless, I should have found the money somehow. But when a year or so ago, someone from Plan Canada knocked on my door and invited me to participate, I could no longer, in good conscience, refrain from reaching out in this way. And so I pledged to send a little bit off every month to assist a kid who could sure use a helping hand: less than the cost of the moderately sized turkey that we consumed for our early Thanksgiving yesterday. 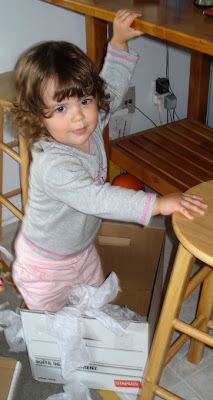 This is my little sponsoree (although spellchecker informs me that's not a word) possibly before she turned three. Warms the caukles of my heart, she does.